← VICTORY! FAST FOOD WORKERS OF NY STATE WIN HISTORIC RAISE TO $15/HR. 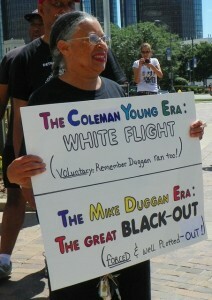 Groups rally at Coleman A. 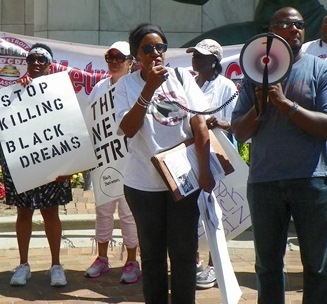 Young Center July 15, 2015 to protest the “Great Black-Out” of Detroit businesses, residents, and services. 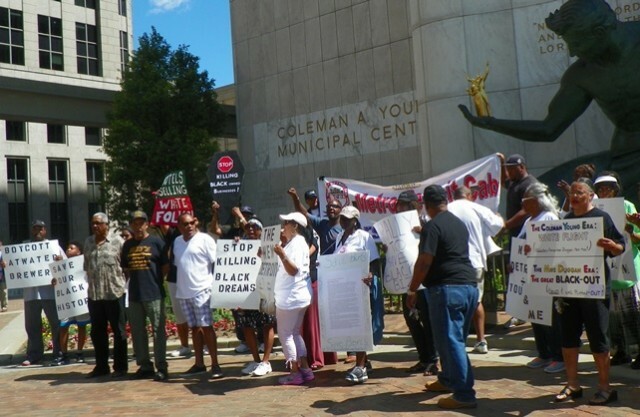 Black cab drivers being replaced by Uber, other unlicensed cab cos.
DETROIT – Black Detroit business-owners, cab drivers, homeowners, city retirees opposing the takeover of the Detroit water department and water shut-offs, and residents campaigning for streetlights rallied July 21 against what they called “The Great Black-Out” of Detroit. 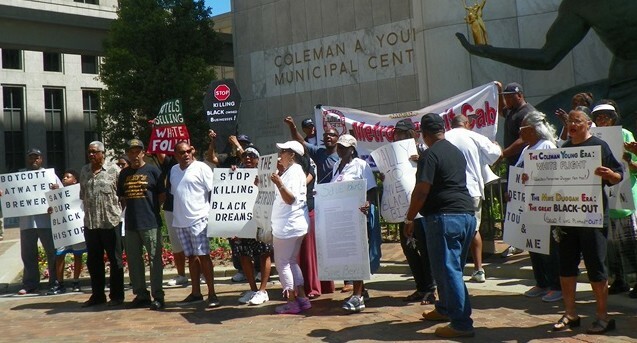 Chanting, “Black Business Matters,” they marched from Hart Plaza across Woodward to the Coleman A. Young Municipal Center. 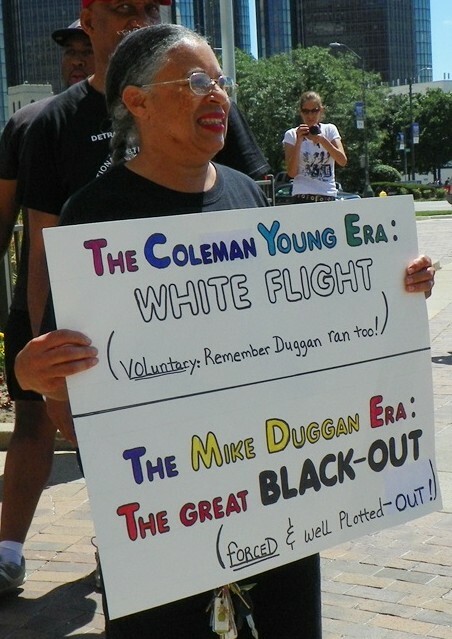 They say Detroit “Mayor “Mike Duggan, Wayne County Executive Warren Evans, Michigan Governor Rick Snyder, landlord-tenant judges, and other government officials are aiding a reverse “white flight” by corporate landlords, entrepreneurs, and hotel owners. “We were here long before Dan Gilbert,” said Marcus Cummings, who chaired the rally at Hart Plaza. Its participants then marched around the Coleman A. Young Center, pledging to return every Tuesday. Darnell Small, owner of Tangerine Supper Club, which has now been shutdown by Atwater Brewery owner Mark Reith. 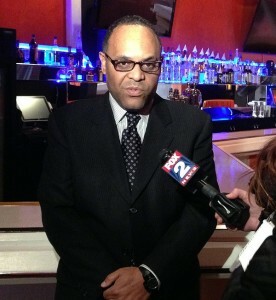 Darnell Small, owner of Tangerine, a nightclub on Jos. 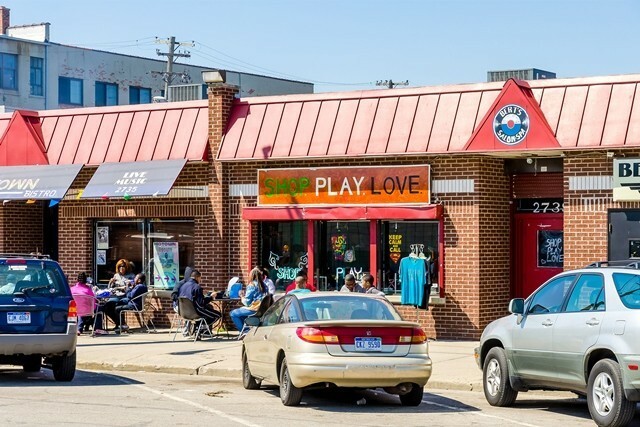 Campau, along with his sister Nicole Small, and Bert Dearing, owner of Bert’s Warehouse and Theater in Eastern Market, spearheaded the protest. Small said he was illegally evicted May 15 from his elegant quarters by his landlord Mark Reith of Rivertown Holdings, who also owns Atwater Brewery next door. 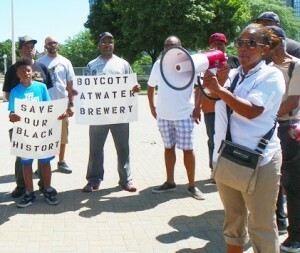 Protesters called for a boycott of Atwater Brewery. Bert’s location at 2727 Russell was sold for $2.7 million on www.auction.com month, but he filed a court complaint July 21 alleging fraud to reverse the sale, with the assistance of RICOBusters. A major player in his eviction is Simon Group Holdings, whose CEO is Sam Simon of Birmingham, Michigan. The company has numerous affiliates including the Atlas Oil Company based in Taylor. 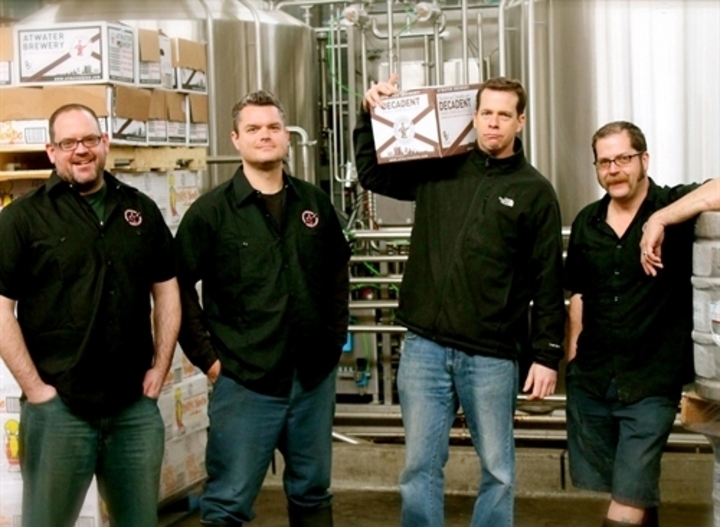 Simon also owns Soaring Pine Capital Real Estate & Debt Funding, LLC, founded in 2014, which RICObusters says consolidated with another company to form 2727 Russell, LLC in order to buy Bert’s at tax auction. 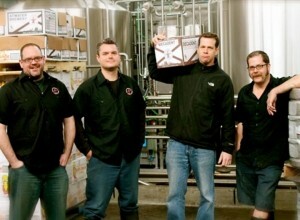 Atwater Brewer owner Mark Reith, second from right, with his leadership team. Nicole Small speaks at rally. Dearing recalled his jazz club’s illustrious history in Detroit. Dearing’s Eastern Market location has been a popular venue for thousands around the world for years. Patrons hold mass meetings in his theater, attend jazz concerts and eat home-cooked soul food in his restaurant, along with barbecue dinners cooked outside during Eastern Market shopping days. Eastern Market was contracted out by the City of Detroit to the Eastern Market Corporation in 2006. The Corporation’s chairman is currently Tom Lewand, who is “Mayor” Duggan’s Group Executive for Jobs and Economic Growth. Since then prices have gone up, causing the commenter to call it “Eastern Mark-Up.” Lewand’s son F. Thomas Lewand is president of the Detroit Lions. 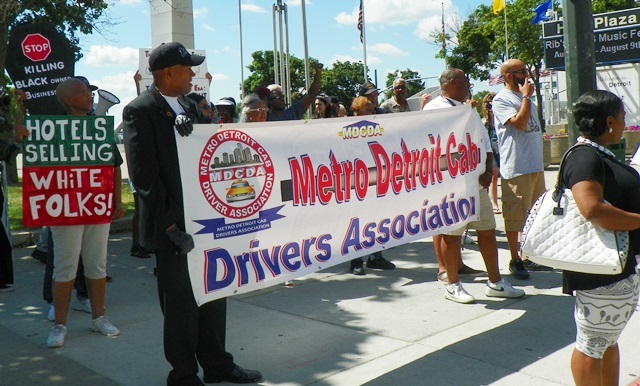 Kenneth “Kabaka” Reynolds of the Metro Detroit Cab Drivers Association spoke as drivers unfurled their banner and honked cabs driving around the CAYMC. His group of mainly Black cab drivers has been fighting Uber, Inc., and Transportation Network Companies, being popularized in local media as “ride-sharing.” Reynolds said they use non-licensed independent contractors who operate their personal vehicles with non-commercial license plates. Despite a state “cease and desist” order to Uber issued in Dec. 2013, Detroit city government entered into an interim operating agreement in May, 2014 with Uber. 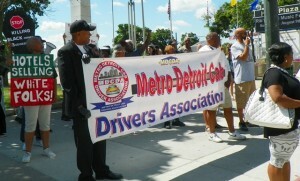 KennethK abaka Reynolds leads march with cab drivers’ banner. He also said Detroit police are harassing legitimate cab drivers with stepped up traffic enforcement and fines. G. Errol Jennings of Russell Woods-Sullivan Neighborhood Association speaking. 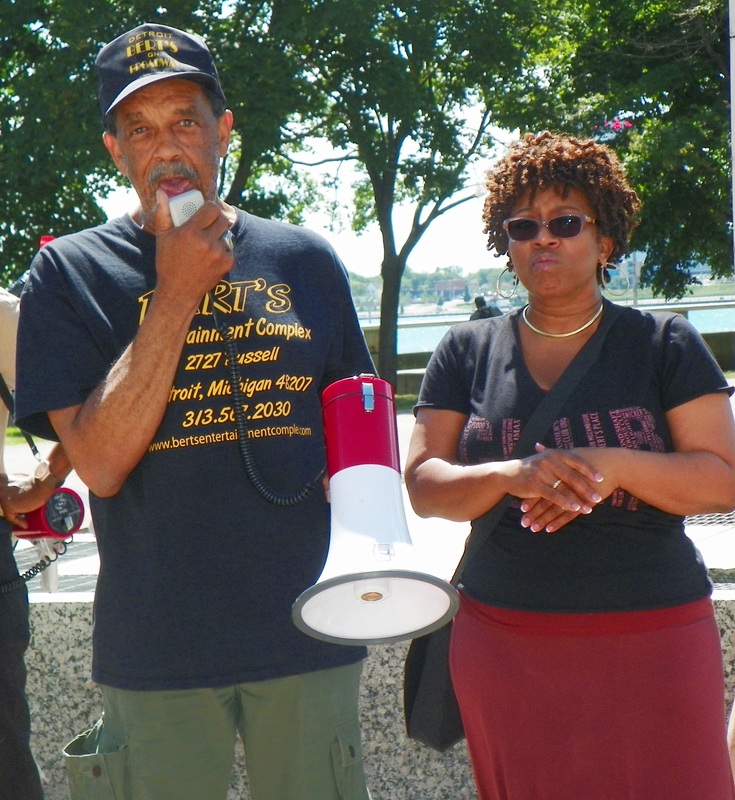 Cecily McClellan, Vice-President of the Detroit Active and Retired Employees Association (DAREA), called on marchers to sign and circulate a legal petition for a referendum to be placed on the ballot regarding the City of Detroit’s contract with the Great Lakes Water Authority. DAREA is a member of the Coalition to Save the Detroit Water & Sewerage Department. It says the coalition will continue circulating the petitions despite a previously-announced deadline of July 27. 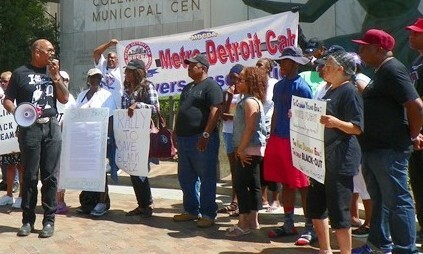 Public Act 233 of 1955, which authorized the contract, giving up Detroit’s largest asset, says 15,000 signatures of registered voters in the city must be collected within 45 days after the publication of a notice informing residents of the contract, and their right to a referendum vote. To date, no such notice has been published. See information on petition campaign and how to obtain them below. Cecily McClellan speaks about petition campaign to save DWSD. Cynthia Johnson of StandUp Now called on members of the crowd to join her group at Dexter and Waveney, near W. Davison, Thurs. night at 9 pm for their weekly protest against the lack of any operating street lights in that neighborhood. The protest was vividly covered that night by Channel 7, which turned off its camera lights to show darkened streets lit only by auto headlights. Johnson said the situation there has led to many traffic accidents and even deaths. The Public Lighting Authority, which is taking over Detroit’s Public Lighting Department, has said it will shut down 40 percent of Detroit’s street lights permanently. 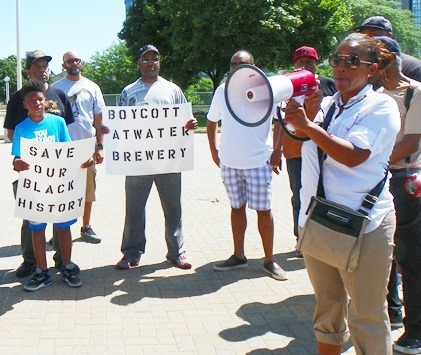 This entry was posted in Uncategorized and tagged BlackBusinessMatters, BoycottAtwaterBrewery, OurWaterOurVote, SaveBert, StandUpNow, Turnonthelights. Bookmark the permalink. It’s essentially ‘taxation without representation’ – we have no elected officials looking out for our interests… Ilitch can get a third of his arena complex subsidized, and give zero annual revenue to the city; the deal with Joe Louis Arena had the city receiving $6 million annually. A state treasurer can order the Detroit City Council – a supposedly independent sovereign body – to have another vote in regards to a water rate increase decision, which they initially rejected – threatening to extend state oversight if they refused… it just goes on and on; John Conyers, Debbie Stabenow, Carl Levin, et al, should be ashamed, as well as the do-nothings in Lansing.